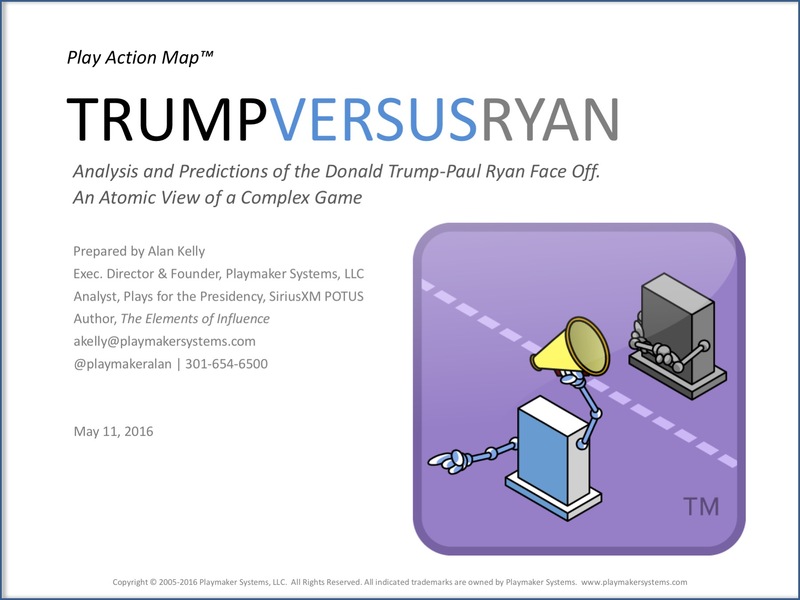 Playmaker Systems today released a one-of-a-kind analysis of the feuding presumptive GOP nominee, Donald Trump, and U.S. Speaker of the House, Paul Ryan. Called Trump Versus Ryan, the study offers a unique illustration of select influence strategies (aka, plays) that each has employed to bring the other to a political heel. Believed to have commenced when Trump made his infamous Dec. 7, 2015 pledge to ban incoming Muslims, this signature Playmaker analysis features 11 stratagems from The Standard Table of Influence, plotted onto a Play Action Map, a breakthrough technique for illustrating the moves and counter-moves of marketplace actors. The study can be downloaded free here.